At the St. Joseph of Volokolamsk monastery, the new Bible museum is a project dear to the heart of professor Irina Pozdeyeva. 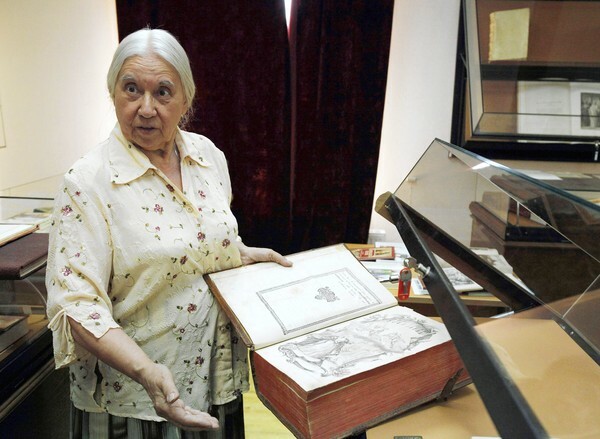 TERYAYEVO, Russia — As she tried to remove the priceless Bible from its glass case, Moscow University professor Irina Pozdeyeva could barely lift the almost 2,000-page book. The gray-haired scholar ran her fingers through the meticulously stitched and restored leaves of the Bible, produced in 1581 by Ivan Fyodorov, father of Russian printing. Pozdeyeva said she never fails to experience a surge of emotion when she handles the book, one of 350 surviving copies of the first Bibles printed in Russia in the old Slavonic language. “How else can you feel handling this treasure?” she said. After a history of Christianity in Russia full of victories and failures, devotion and scorn, adoration and neglect, the Museum of the Holy Bible will open this fall at the out-of-the-way St. Joseph of Volokolamsk monastery, about 70 miles northwest of Moscow. The museum, which has about 800 Bibles from all over the world, is preparing to display about 300 of its most prized pieces, including volumes dating to the 16th century. Pozdeyeva, a senior researcher at the museum, showed off the most curious treasures in an auxiliary building of the monastery, built for the purpose. She was referring to an image of Russian Empress Elizabeth I, daughter of Peter the Great, wearing a luxurious royal dress ill suited for the pages of a holy book. From the jolly Bible of Elizabeth I, Pozdeyeva proceeded to another impressive volume, which on the bottom of the first few pages had a handwritten inscription: “This book was commissioned by Czar Mikhail Fyodorovich” Romanov, the first czar of the Romanov dynasty. Another rarity, a massive Bible produced in 1663, had what may be one of the first maps of Moscow showing the Kremlin, surrounded by the Moscow River and residential areas. The collection also contains a number of more recent but nonetheless unique Bibles, among them holy books with etchings by French illustrator Gustave Dore and drawings by Salvador Dali. “Everybody knows Dali as a great painter, but few know him as a Holy Bible illustrator,” Pozdeyeva said. Pozdeyeva was born in Volokolamsk, several miles from the monastery. Her grandfather, an Orthodox priest, was arrested and executed in 1937, and her father, a doctor, was sent away that year to a labor camp for an 11-year term. By that time, the monastery, which had been closed in the 1920s by the Bolsheviks, was turned into an orphanage and a secondary school. Her mother found a job there as an orphanage doctor, and Pozdeyeva recalled going to her first classes there. In 1966, the makers of the film version of “War and Peace” came to the monastery to shoot the 1812 burning of Moscow. Some residents still recall with pleasure how they were greeted by Emperor Napoleon Bonaparte as he stood on the steps of the monastery, smoking a cigarette and talking in Russian to children who were on their way to school. St. Joseph of Volokolamsk, who founded the monastery in the late 15th century, started its tradition of collecting old books, obtaining about 1,000 handwritten Bibles. Most of them found their way into state-run museums after the monastery’s closure. In 1989, the monastery was returned to the Orthodox Church’s Moscow Patriarchy. Its then-prior, the late Metropolitan Pitirim, was also a book lover who amassed a huge new collection of Bibles that now make up the bulk of the museum library. By law, the monastery can’t get back from the state the treasures the Bolsheviks took, but it is counting on at least renting some of the ancient manuscripts to display for the opening of the museum. The museum, which has no state funding, survives thanks to assistance from sponsors, and it expands its collection with Bibles donated by Russians such as a woman named Ariadna Razumova. Pozdeyeva, the scholar, is certain the new museum is worthy.